There was a time when beer purists giggled into their snifters when Oskar Blues put Dales Pale Ale in a can. Good beer in aluminum? Sacrilegious! Fast forward a few years and the vast majority of breweries jumped on board to put their very good beer in aluminum cans. Then cider makers started putting their apple hooch in cans and wineries thought to themselves, “yeah, let’s do that too,” and we got the great “wine in a can” movement. So it’s simply a matter of evolution that we’re now seeing craft cocktails distributed in cans. And I’m not talking about the saccharine Bartles and Jaymes wine coolers or Malibu “diabetes in a can” that your mother loved so much in the ‘80s. This new breed of “to-go” cocktails are well crafted with natural ingredients and real booze, and they’re worthy of your attention. The fact is, most canned cocktails that we’ve seen in the past are just malt liquor that’s flavored to taste like a certain cocktail. Mile High Spirits goes back to basics and uses actual vodka (their own Elevate Vodka) as the base for this Moscow Mule, along with natural ginger and lime and real beet sugar instead of high fructose corn syrup. And when you think about it, the ginger-based Moscow Mule might be the perfect cocktail to put in a can—it’s zesty, carbonated and refreshing as hell. Ballast Point released an entire line of canned cocktails in 2015, using their house-made line of spirits as the base. The options are pretty straight forward—a gin and tonic with their Old Grove Gin, a rum and ginger and rum and coke with their Three Sheets White Rum—but this Bloody Mary might be the best of the lot. Ballast Point uses their Fugu Vodka and their own mild Bloody Mary mix, which is actually a blend of fresh tomatoes, spices and amber ale. The combo in this 7% ABV can is spot on. And think about this: now that we have a solid Bloody Mary in a can, that means you can celebrate brunch anytime, anywhere. Can Can is a startup out of Sacramento that held a successful Kickstarter campaign earlier this year and is set to release their line of canned cocktails this fall. We haven’t had them yet, but the packaging is slick and the ingredients seem legit, especially in this bourbon-based cocktail. It’s made with cane sugar, molasses, mint, Angostura Bitters and actual bourbon and promises to land on the sweet side of things with a strong sassafras flavor. Word on the street is the founder of Can Can has been working on this particular recipe for seven years. And here we have the gold standard of cocktails in a can. 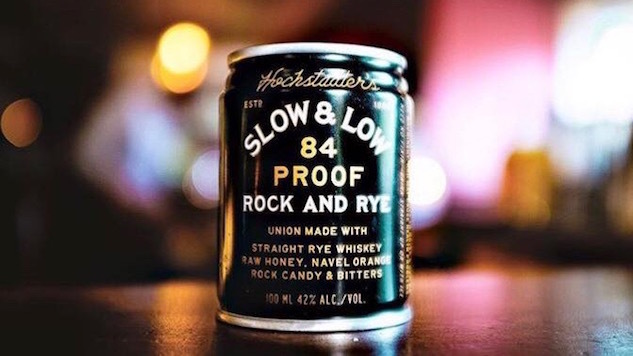 Hochstadter’s Slow & Low is the tiny canned version of the bottled cocktail of the same name. And it’s good. It’s also 84 proof, making it a bit of a game changer in the canned cocktail world. Cooper Spirits Company combines aged straight rye with oranges, raw honey, Angostura Bitters and some rock candy for this well-made cocktail that feels a bit like an Old Fashioned if you dropped a piece of rock candy in it. Of all the canned cocktails on the market, this is the one you should get most excited about, especially if you’re a whiskey lover.